Ferrero Rocher® is a unique and delicious chocolate experience made by Italian chocolatier Ferrero, since 1982. The chocolates are a tempting combination of smooth chocolaty cream surrounding a whole hazelnut; within a delicate, crisp wafer. . . all enveloped in milk chocolate and finely chopped hazelnuts. The chocolates are individually wrapped in gold foil. Yes! You've read that right! 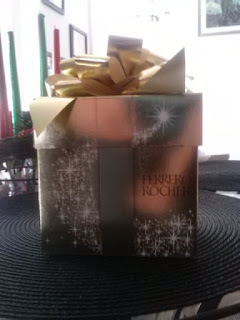 The my surprise holiday box is a yummy box of Ferrer Roche Chocolates! I was in complete and utter shock, it was a great cheery gift. Milk chocolate covers a crispy wafer and hazelnut center, making a deliciously delightful sweetness with a crunch. Influenster has graciously sent this in exchange for testing and my honest review. This makes a great holiday gift for the chocolate lovers in your life. Visit Ferrero Roche to find out where to buy yours today. I love these! So addicting! Chocolate-Ferreo Roche--what could be better? ?